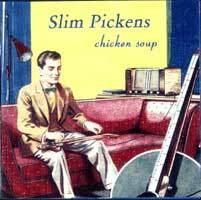 "Foot stompin grooves, bareboned Delta fingerpickin styles and smooth vocals" is how Mark "Radar" Watson describes Slim's debut album "Chicken Soup". Slim got into blues as a teenager in the 60's and played guitar in a couple of bands before making the switch to bass at age 18. Once he committed to being a professional musician, he has played many styles of music from rock to jazz, Irish music, folk music, reggae and funk. In the 70's he toured the length and breadth of Australia continually for 3 years with a professional funk / dance band from Perth in Western Australia. Then in the 80's Slim travelled to in India to further his music studies, and during this period experimented and picked up skills on a range of instruments ...mandolin, sitar, dulcimer, didgeridoo, Double Bass and also recorded several albums. In the 90s he moved to Byron Bay, and began playing double bass with the rockabilly trio "The Purple Drippers" who 'discovered' him busking with his white double bass at the Byron markets. The 'Drippers' are a fun showband and wear purple suits - which set off Slim's white double bass nicely. They have been performing together as a unit for 18 years and Slim was their first personel change - he took over the bass playing duties and also inherited the stage name "Slim Pickens" (the other members a Rex Stix and Ralph Launcher). Slim also began playing in the alternative pop duo "Waiting for Brian" with Michael O'Grady. 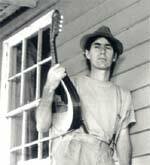 But it had long been Slim's yen to start performing his own favourite music - Ry Cooder-influenced delta blues and the old-timey songs handed down to him by his father, who was also a professional musician. As finger-pickin' blues was the mainstay of this style - the name Slim Pickens suddenly took on a whole new meaning. Slim began fine-tuning his stage act at the Bangalow Hotel which has run an 'open mike' showcase for original music for over ten years on a Tuesday night. At about the same time Dr. Baz, who lives nearby in the town of Bangalow, began attending the night and exploring his new found passion for the piano accordion with anybody who would have him up for a jam. Slim and the Doctor - who, as it turns out, were born three days apart - hit it off so seamlessly and effortlessly, as though they'd played together for years, and thus began a long and fruitful musical collaboration. Slim has written and recorded the soundtrack for an ABC television documentary "Trek". His first solo album Chicken Soup, features Slim's polished vocals and rich resonator guitar style (see the link on the left for our page on 'dobro' guitars), and has been heard on Blues radio shows in Argentina, Denmark, Germany, and the USA as well as here in Australia. In 2003 he signed a publishing deal with the ABC and had one of his recorded tracks played in New York as part of the September 11th Commemoration ceremony. Slim's song "Who Cares" went to No.1 on the Blues Charts of the popular American web-site garageband.com. Another of his songs "Losin' Sleep" has been getting national airplay on ABC radio. Slim is currently working on his second solo album.